The rock is rough rhyolite, a touch flakey in places but generally sound. The landings are friendly and free of any significant bogginess, just watch out for nettles around on the shadowy side in the summer. Conditions: An open, sunny venue with no significant seepage issues. The exposed position ensures that it catches any wind that might pick up. This does make for quick drying rock and less midge-blighted evenings in the summer than might be expected, however it can be surprisingly cold up here in the winter. 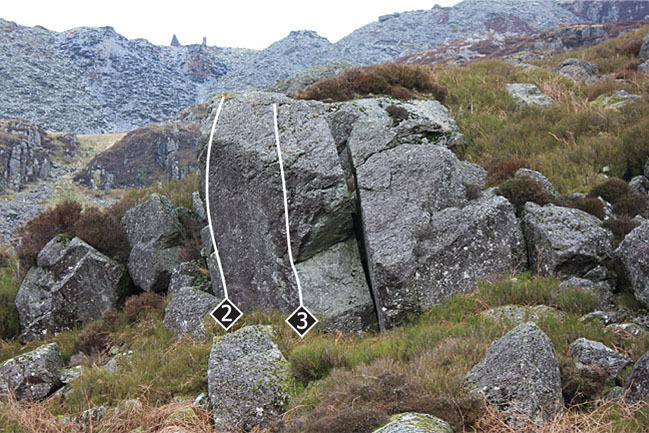 The first problems can be found on the lone boulder in the centre of the ancient quarry. Turn up just after the five bar gate and walk up to reach the boulder which is slightly hidden to the right of the old winding house walls. Return to the track and continue up it as it turns into a long gentle incline running leftwards up the hillside left of Chwarel Manod. Just before you reach the point where the angle of the incline flattens out an attractive wall is seen 40m to the left, just beyond a stream. The left arête of the steep, narrow wall taken from a sit down start. 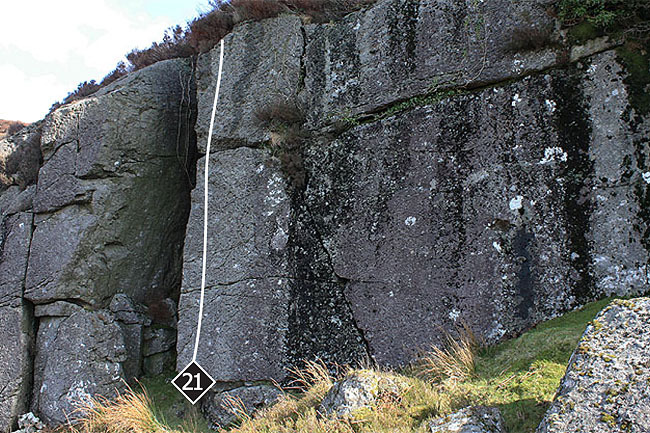 The right arête of the wall also goes from a sit down start. It is possible to climb a good ‘blinkers – on’ eliminate up the wall between these two problems. Just after the point where the angle of the incline flattens out you should be able to spy a large split boulder approximately 150m away diagonally leftwards from the path. 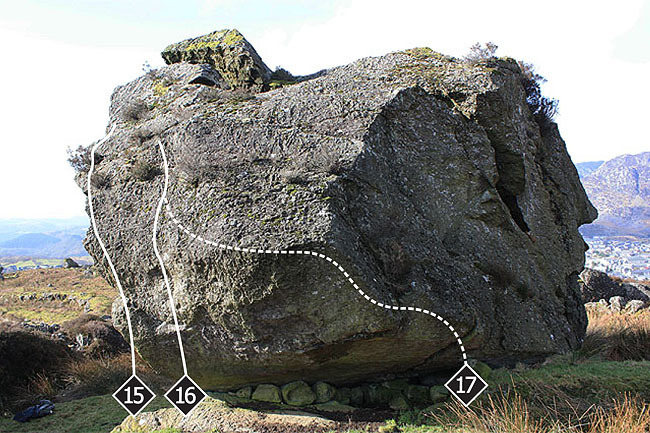 Cross the fence and make a beeline for the boulder – this is the main event! 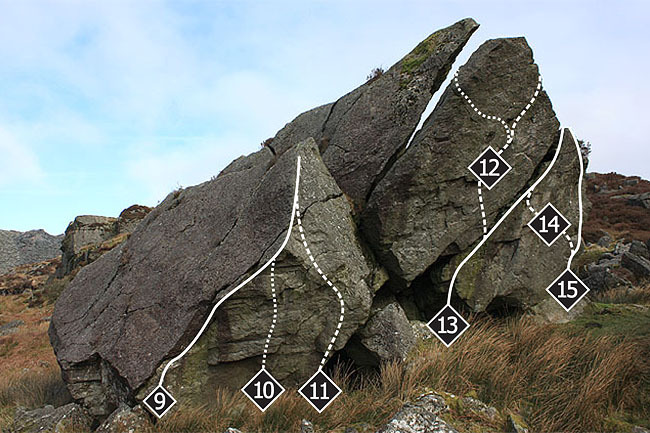 Make the transition from steep to slabby a metre or so right of the arête. 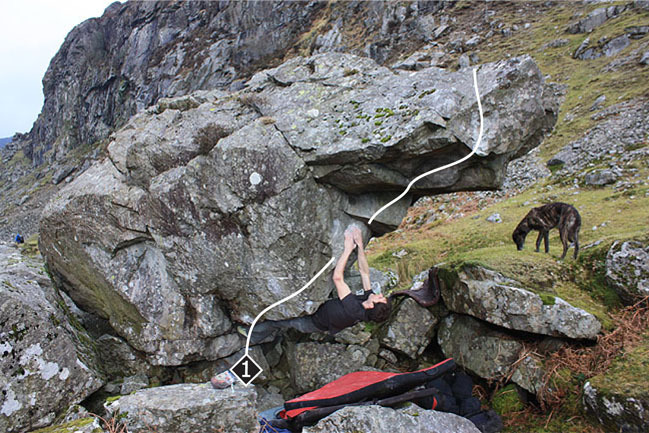 A hard, board style line up the steep little face left of Y Creigwr. On the path side of the adjacent boulder there is a neat wall problem. 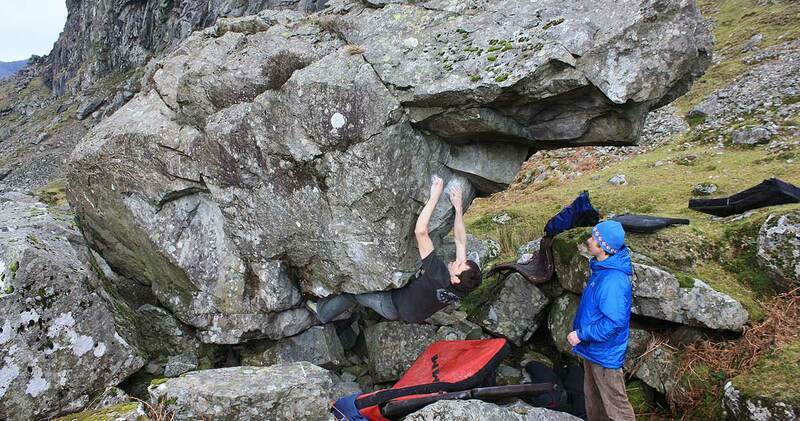 A great problem up the arête; the landing does require care though. 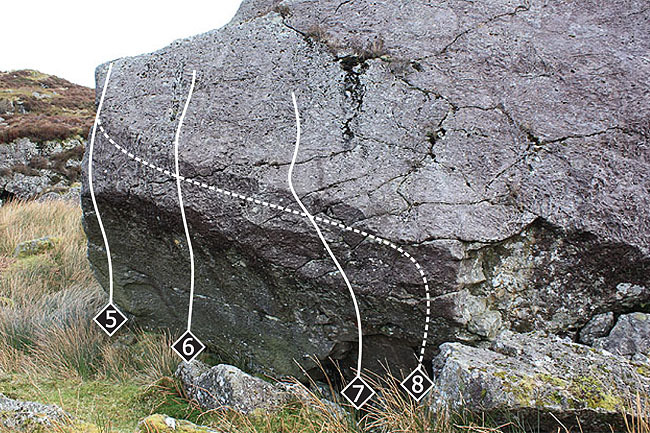 The 6A low start adds some tricky moves. The wall between the arête and the dirty crack goes at 6A. The dirty crack was once climbed, but has since reverted to nature. 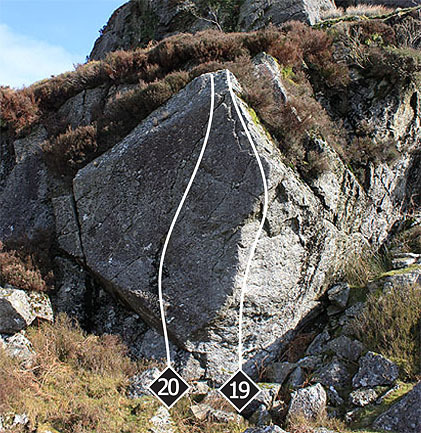 A couple of highball lines were also done up the wall to the right, but these have the same type of scary heather exits as Plentyn Thatcher.